I spent many a happy summer helping my Grandma at her Church garden party. The weather always seemed good, there was always cake and people happily wandering around chatting and playing strange and obscure games (that to this day I’ve never quite figured out). The joy of those garden parties was their community feel, everyone coming together, celebrating the summer, chatting to neighbours and getting to know one another. Oh and eating cake. 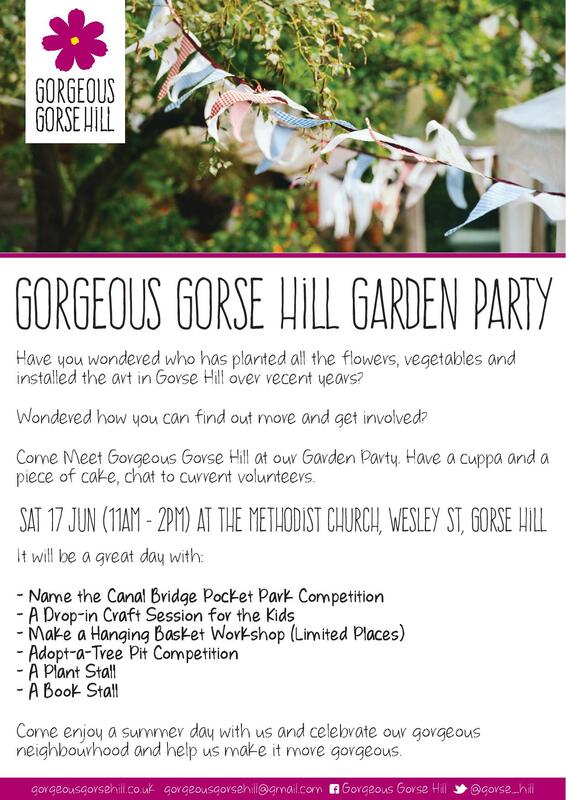 So, in that grand tradition Gorgeous Gorse Hill is having a garden party this year on the 17th June. We can’t promise obscure outdoor games, but we can promise cake, plants, community spirit and a chance to get to know your neighbours. It’s important for us that people know who we are, what we do and how they can get involved and what better way to do that than over a cuppa and cake. We’ll also have creative fun for kids, a plant stall, a book stall, a hanging basket workshop with the amazing Joe from Marlborough Road allotments (this is a limited place workshop so arrive early to book your place and avoid disappointment). We’ll also have competitions: you can join in our Name the Canal Bridge Pocket Park Competition and also our Adopt-a-Tree-Pit Competition where residents plant and brighten up an adopted tree pit with the winning one being chosen in September. So, what’s stopping you, come see us. Did I mention there was cake.